If you produce waste classified as hazardous, then you’ll need to comply with the current waste management regulations. At Direct365, we provide affordable services to deal with various types of hazardous waste, including sharps, pharmaceuticals, fluorescent lighting tubes, aerosols, batteries, inks, oils, pharmaceuticals and more. We take responsibility for ensuring that your hazardous waste causes no harm in the disposal process, and we record all your legal paperwork so you don’t have to. Your service will cover exactly what you need, including the correct bins, suitable collection times and no surprise costs. Whatever your waste requirements, we can offer you expert advice and a professional service to match. Do your business a favour and get in touch for an instant quote. 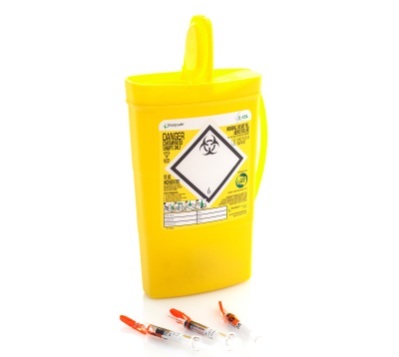 Hazardous Waste (EWC 18-01-03) also referred to as clinical waste is often found in healthcare establishments such as health clinics, hospitals, doctors surgeries, residential and nursing homes, and veterinary practices. Although it often extends and is also disposed of by other non-healthcare businesses such as funeral directors and tattoo parlours. It is important to segregate your hazardous waste under HTM 07-01 guidelines. With every waste collection that contains hazardous material you’ll receive a consignment note detailing the type of waste collected, its EWC code, the quantity, components, hazard code and container type. Each time you will need to supply us with your hazardous waste producer registration number. If you do not have one, you will need to register with The Environment Agency annually (unless exempt). It is vital that you have the registration number. If not, we cannot take your waste away. If you prefer, we can do this for you!